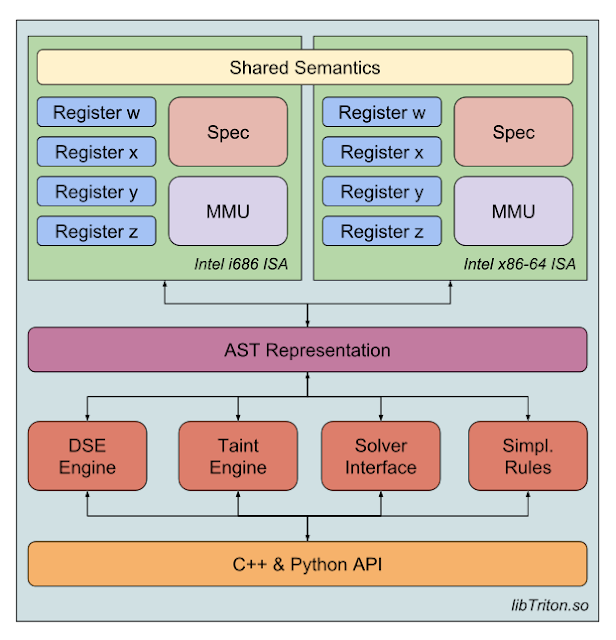 Triton is a dynamic binary analysis (DBA) framework. It provides internal components like a Dynamic Symbolic Execution (DSE) engine, a Taint engine, AST representations of the x86 and the x86-64 instructions set semantics, SMT simplification passes, an SMT Solver Interface and, the last but not least, Python bindings. Based on these components, you are able to build program analysis tools, automate reverse engineering and perform software verification. As Triton is still a young project, please, don't blame us if it is not yet reliable. Open issues or pull requests are always better than troll =). A full documentation is available on our doxygen page. A blog is available and you can follow us on twitter @qb_triton or via our RSS feed.